Five years ago Downfall's release saw the German film acclaimed for its portrayal of Hitler's last days. But since then it has become almost as famous for a wave of internet parodies of its climactic scene. He described: "A unit of cultural transmission, or a unit of imitation... Examples of memes are tunes, ideas, catch-phrases, clothes fashions, ways of making pots or of building arches." He is angry because Cristiano Ronaldo has been sold to Real Madrid. Or because the ending of Watchmen has been changed. Or that Hillary Clinton has lost the Democratic presidential nomination. Or that Kanye West interrupted Taylor Swift at an awards show. It's become one of the best known "internet memes" around, a comic construct that has spread inexorably on YouTube and other platforms like a cultural version of Japanese knotweed. In the original movie, the climax for many viewers might be the moment in the bunker when Hitler is told of the failure of General Felix Steiner to gather enough troops for an attack to ward off the Soviet advance on Berlin. 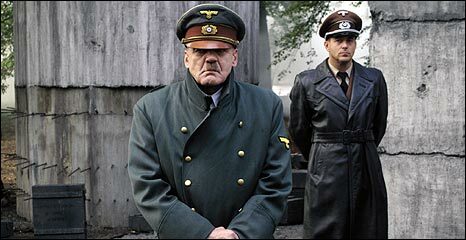 In this three-minute, 50 second scene, Hitler, played by Bruno Ganz, plunges between frothing vitriol and terrifying suppressed emotion as he confronts his top generals. The rest of the staff, standing in the corridor outside, listen rapt to the exchange. But the parody makers have taken this clip, put it through a programme like Movie Maker or iMovie, and added their own subtitles, synced as closely as possible to the audio. In some parodies, Hitler is being the public figure that is lampooned - Hitler becomes Hillary Clinton losing the nomination, or BBC chief Mark Thompson having to face Jeremy Paxman. But in many of the parodies, Hitler is simply reacting to events, the relegation of Sheffield Utd or Usain Bolt breaking the 100m record. "It was just lucky. There is no particular reason why Downfall should have taken off." Every day in bedrooms all over the world there are bedroom comedians dreaming of creating something that will spread like wildfire. Most of their work goes unregarded, but to Thompson, they are the inheritors of the punk ethos. "Maybe Downfall was in the right place at the right time. It coincided with the launch of YouTube. "Once it becomes successful it is unstoppable. It is by word of mouth, or word of tweet. The internet does what it was designed to do. It enables two-way communication." As with any internet meme, the precise origins are unclear. But the credit for perhaps the most popular version, Hitler gets banned from Xbox Live, which has racked up more than 4.2 million users, was claimed by British student Chris Bowley. And the film company behind Downfall, perhaps understandably, prefers to focus on the acclaim for the movie and the $100m it grossed at the box office. "The impact of the movie has been tremendous, both on a commercial and on an artistic level," says Martin Moszkowicz, an executive at Constantin Film. The parodies have caused some issues. "We as a corporation have a bit of an ambivalent view of it. On the one hand we are proud the picture has such a huge fanbase and that people are using it for parody. On the other hand we are trying to protect the artists." As such Constantin Film has caused many of the parodies to be removed from YouTube and elsewhere. "It is a task that can never be completed. They are popping up whenever we are taking one down," Mr Moszkowicz admits. But while many people who have seen the parodies before seeing the film may have a strange feeling of deja vu when they get to the climactic scene, it won't ruin things for them, says Daily Telegraph film critic David Gritten. "Some of them [the parodies] are absolutely wonderful. [But] I can't imagine it would ruin anyone's enjoyment of it. "Ganz's portrayal of Hitler is so entirely full-on, so entirely convincing. He sears himself on your eyeballs." And the Downfall parody meme has gone so far, that there are numerous versions sending up the whole meme itself. 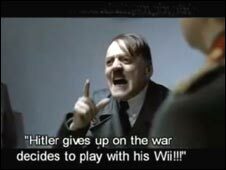 In What does Hitler think of the Downfall meme?, Hitler rants: "This joke stopped being funny in 2008. This was only half-way clever the first time around." "It's really the nature of the internet that once something reaches a critical mass it starts perpetuating itself out of its own momentum," says creator Andy Nordvall, who uses the name Masters of Humility. "The sheer randomness and seeming arbitrary nature of what goes viral becomes part of the viral-ness itself." And at the heart of the craze is the ease of joining the bandwagon. "Just find the clip online, subtitle it, and voila, you're a filmmaker. It's intoxicating just how easy it is to make your own Downfall parody." Of course, some of the parodies are inevitably controversial. A Hebrew-subtitle version bemoaning the lack of parking in Tel Aviv caused some consternation in Israel last year. But it shows the international appeal of the meme. There have been parodies everywhere from Poland to Malaysia. And some may draw positive conclusions from the idea of young people now feeling comfortable lampooning Hitler. Downfall director Oliver Hirschbiegel told a magazine earlier this year that he had seen many of the parodies and could see the merits of the idea. In many ways the parodies take things full circle. Allied propagandists at the beginning of World War II tried to paint Hitler as an undignified, cartoonish and flawed character, thinking this would better serve morale than the image of a remorseless, evil mastermind. And the creation of a human but still evil Hitler is what Downfall was setting out to achieve. There are two levels that the meme's humour works on. The first and most obvious is seeing a once-feared man reacting to seemingly banal news with intense emotion. The one where he finds out Pokemon aren't real is really very good fun. The second level is seeing a video reflecting on modern issues put together with good timing. There's one about scientific peer review where Hitler rages about the third reviewer on a journal article he's trying to submit. It's funny to anyone who understands the topic because you can easily imagine the vitriol from any professor, and there aren't many research students who haven't made the dictator analogy to their own professor at some time or another. This meme is so popular because it can be attached to so many events. The leader asks a question about progress, the supporters give him the bad news, the leader expresses concern about what he thought was happening, the supporters repeat the bad news, the leader realises that the challenge has been lost and describes all the opportunities they will now never achieve. The original happens to be about a dark period in history but the key story sequence occurs every day for all of us. I am so looking forward to a few UK Election versions. BBC - come on. The best parody (in my opinion) is Hitler hearing about the Oasis split. 700,000+ views. Who does your research? Hilarious. There are two main types of this meme - the long one showing Hitler exploding with rage when he's told Steiner's attack didn't happen, and a shorter one where Gunsche tells Hitler they can't find Fegelein. The first works because we can all identify with someone raging at something not going as planned, and the second works because all of those are just surreal - using such themes as Hitler discussing the pros and cons of Wii Sports Resort etc. As a German teacher I understand everything the actor is saying in the original film so its hard for me to appreciate the subtitled jokes. Mostly I am just sick of seeing the same thing done over and over again. The popularity of this clip is a clear indication of how access to technology has led to the democratization of the dissemination of information, and our ability to now make OUR voices heard in a way that frightens politicians, big business, teachers, institutions, and the established media industry. This clip is often a valuable and far-reaching tool for social commentary, while being an entertaining way of publicising one's position on any number of issues. Taking two polar opposites and joining them seamlessly is a standard source of humour. Hitler represents the very depths of human depravity, but when joined with utter triviality like the lack of features on the iPhone or a lukewarm response from the local WI, and the conjunction is always likely to be very funny. Well that's finally killed off this meme for good. The only thing that can kill a well established meme is mainstream publicity.